An unbelievable piece of art that’s made from Pink and Green Tourmaline, Diamond, and 14kt Yellow Gold. The Tourmalines are “AA” in gem quality and color.The carved butterflies in the center are accompanied by gorgeous Diamond scroll work that’s made from 14kt Gold. The Diamonds have a total weigh of 0.20ct and are excellent in Diamond quality. 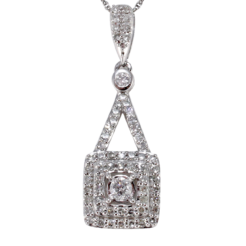 Celebrate the glory of Spring with this outstanding Pendant.